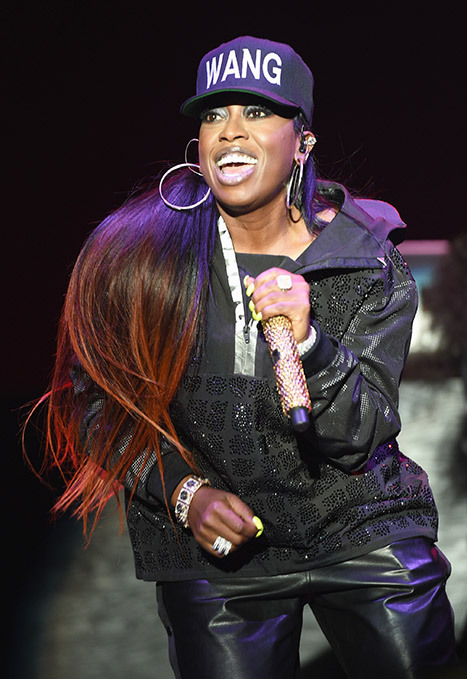 Missy Elliott Has Seriously Slimmed Down — See Her Weight Loss Here! Is that you, Missy Elliott?! The "Is That Your Chick" rapper looked skinnier than ever while performing at the Alexander Wang x H&M Collection Launch in New York City on Thursday, Oct. 16. The hip-hop star, 43, looked energetic and happy when she took the stage at the Fort Washington Avenue Armory, wearing a "Wang" baseball cap and leather pants. Elliott got the crowd on their feet, performing hits "Get Ur Freak On," "Work It," and "Lose Control." In a Twitter photo, the star&apos;s weight loss was on full display. "Just got off stage thanks @ALEXANDERWANGNY and @hmusa for having me perform I enjoyed [muah!]" the rapper captioned a photo of herself backstage looking seriously slimmed down wearing a tracksuit and hat which read "You Can&apos;t Workout With Us." Elliott has been vocal in the past about battling Graves&apos; disease, an autoimmune disease that attacks the thyroid and can cause nervousness, excessive sweating, weight loss, and palpitations. The "Work It" singer had been staying out of the spotlight; she last released a studio album in 2005. After getting off her medication for the disease, the rapper told Us in 2011: "I feel great… I&apos;m completely managing the condition through diet and exercise."